Professional Capezio K360 Tap Shoes, normally $350, get them here at 56% of the price! This message is for tapdancers – performers and students. 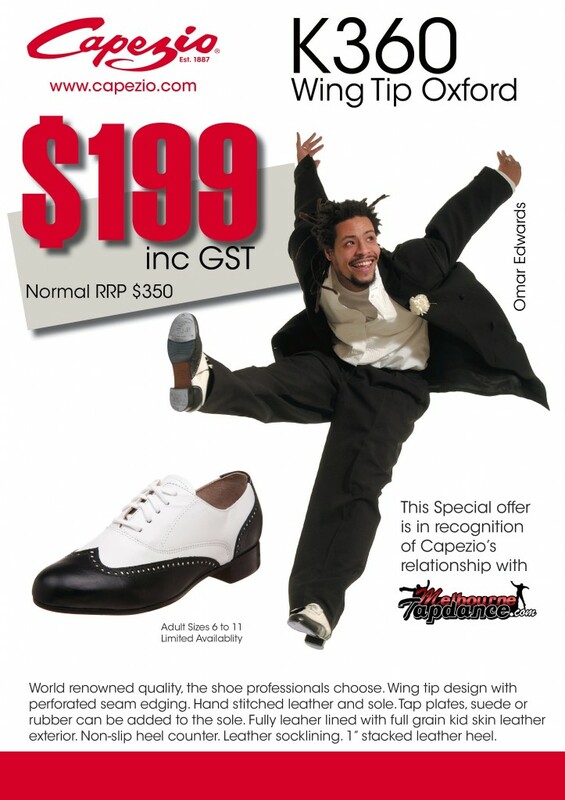 Tired of uncomfortable tap shoes that fall apart easily, don’t sound good, don’t support your tapping and look boring? The Capezio K360 Tap Shoe has been our answer to this old problem! In terms of comfort, sound, control and durability, we have been personally wearing this model of tap shoe – Capezio K360 – as our shoe of choice for the last 4 years. The leather is supple on top (for comfort) and hard and non porous on the bottom (for a good tap sound), it is shaped to support your control and speed when tapdancing. This is the same type of shoe that Savion Glover wears (he gets an extra 1-2 layers of leather custom added to the sole afterwards by his shoeman for an ever bigger sound) as well as many great tapdancers who have made it their shoe of choice. You finally don’t have to make the trip to America to get these shoes, or pay expensive shipping halfway across the world. A limited stock is now available here, posted from Victoria, Australia at this very appealing price until sold out! Get yours now from home by following the steps below or visit the Capezio store at 14 Milgate Drive, Mornington VIC. Being a professional level tap shoe, it will last you a long time and be a whole new level of comfort, control and sound to what you are already used to! How to Order from where you are, right now! Men: order Same size as your normal (US) street shoe size. 3) Select Quantity (e.g. 1) and click Buy. 5) Add 1 set x Teletone Heel Tap and 1 set x Teletone Toe Tap to your cart by clicking on them. 6) Click Checkout and enter PROMO CODE: k36020 for a 20% discount on your tap plates. 7) Fill in delivery and billing details to complete your order! Delivery is Australia wide by ExpressPost (calculated at checkout, reasonably priced) with a tracking number – we usually get ours the next day!